A dating website’s claim that it used a “scientifically proven matching system” to pair up those looking for love, has been banned. 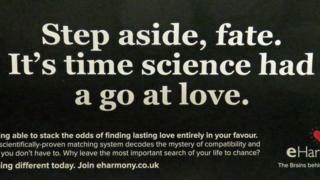 An advert for eHarmony on the London Underground in July read: “It’s time science had a go at love”. The Advertising Standards Authority (ASA) called the claim “misleading”. The online matchmaker said while it “respectfully disagrees” with the ruling, it will make its advertising “as clear as possible”. The website was unable to offer the ASA any evidence that customers had a greater chance of finding love, despite claiming that its “scientifically proven matching system decodes the mystery of compatibility and chemistry”. “Imagine being able to stack the odds of finding lasting love entirely in your favour,” the advert read. The initial complaint was lodged by Lord Lipsey, the joint chairman of the All Party Parliamentary Group on Statistics and a former member of the ASA council. He said the phrase ‘scientifically proven’ should only be used in claims that are “just that” and not “crude puffery designed to lure in those longing for love”. “This is a new form of fake news which the ASA has rightly slapped down,” he added. But the website said it matched singles using “sophisticated matching standards designed by PhD psychologists”. It uses an algorithm which requires users to complete questionnaires to determine their personality traits, values and interests. The service, which claims to be known as “the brains behind the butterflies”, matches users to those whose responses complemented their own preferences. The algorithm is data driven; using statistical models made from the information of more than 50,000 married couples. Romain Bertrand, managing director at eHarmony UK, said the service was conceived on the premise that “science and research could be harnessed to help people find love”. The company believed consumers would understand its advert to mean that its scientific approach could potentially work for them – not that it would guarantee love. But the ASA concluded that consumers would interpret the claim “scientifically proven matching system” to mean that scientific studies had found that the website offered users a significantly greater chance of finding lasting love than what could be achieved if they did not use the service.